Mandrogi village is unique. The heyday of this area took place in the era of birch-bark scrolls. Vepsians, indigenous inhabitants of this land, are hard-working and hospitable people with many fishermen, hunters and shipbuilders among them. Vepsians always actively traded furs with European and Asian countries. They sailed along the river Svir (which means 'deep' in Vepsian language). Despite its name, some parts of the river are so shallow that sailors had to unload cargo and drag boat along the shore. Hence the name of the village - Mandrogi - which means 'thresholds' in Vepsian. These lands have always been famous for carpentry. The tradition is still alive, and the works of local craftsmen can hardly be surpassed. 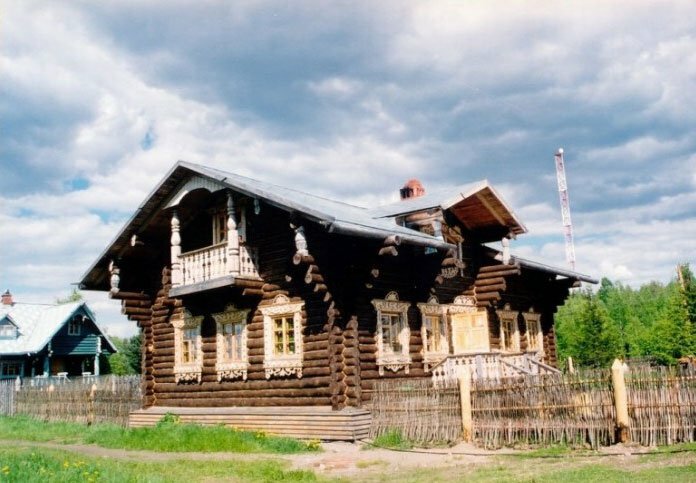 Mandrogi village is a true open-air museum of wooden architecture. During the WWII Mandrogi village which numbered 29 yards burned down. People settled in neighboring villages. Only the foundations of the original buildings survived, and later new buildings were erected upon them, such as Vodka Museum, Post Office and dwelling houses. Revival of Mandrogi village started in 1996. Today its permanent population is over 100 people. More than 200 people commute to work here every day. The village has its own kindergarten and school, stables and barn, quail and rabbit farms. Here you can taste local bread and pies baked to grandmother's recipes. In the Vodka Museum you will be offered a 40-degree herbal drink made according to Catherine II recipe. In the crafts village you will have change to get acquainted with local handicrafts, take part in master classes and buy souvenirs.